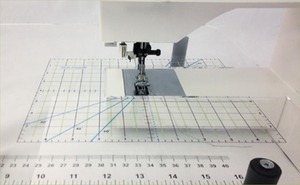 Universal Grid for Sew Steady Tables & Inserts – Fit this to the underside of any table or insert for additional ruler guidance around the free arm. This 8"x10" grid features a centering ruler 5" each side, standard measurements and angles. Includes table lock to ensure accurate measurements at the needle at all times.